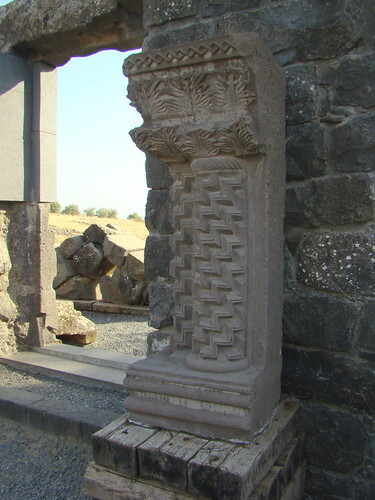 From the Corazim synagogue: one of two columns that would have flanked the ark where the Torah scrolls were kept. The column is a pair of stylized date palms — which are not found around here. They are typical of desert oases but not of this richer, semi-arid site. I wonder if they were intended to evoke the Sinai Desert, where Moses received the Torah. The zigzag lines are highly stylized, yet an uncannily good evocation of the patterning on a real date palm’s trunk. The rock here is basalt, very hard and difficult to work. Nevertheless, the synagogue was richly decorated with beautiful carvings. It dates from the early 4th century CE, with restoration work in the 6th (after an earthquake).